A coal miner at age 13, Stan Coveleski didn't reach the majors to stay until 1916, when he was age 27. The spitball artist had his best years with Cleveland from 1918 to 1921, winning 20 games or more each season. 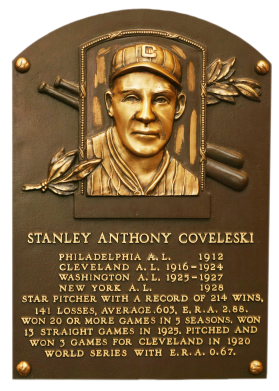 Coveleski won 215 games, while his brother Harry won 81. Stand lost only 142 games and retired with a lifetime 2.88 ERA. 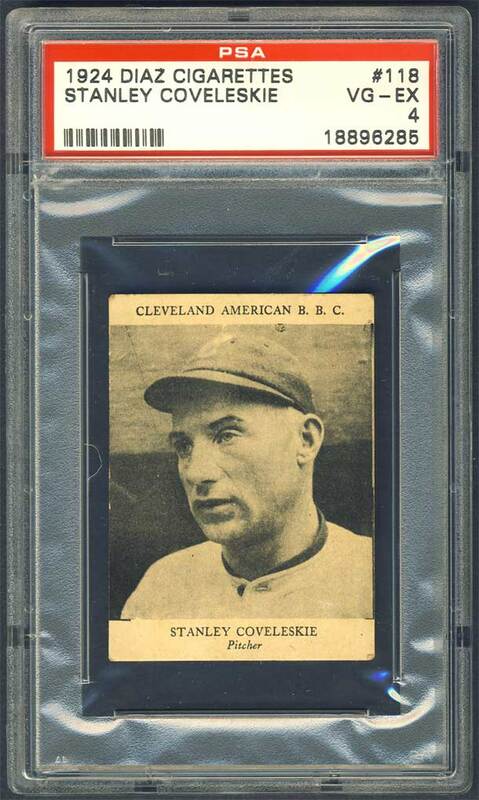 Comments: My first portrait of Stanley Coveleski was a 1983 Diamond Classics card I purchased in July, 2000 and had professionally graded MINT by PSA. It was a placeholder until I could get my hands on an item contemporary to the player's career. After lots of research I realized the 1924 Diaz would be the only issue which would meet the criteria of showing Coveleski's face while being printed during his career 1912-1928.. Unfortunately, I had never seen a single example of the card and found out neither had any of the top Cuban card collectors. The set only contained portraits of pitchers from 1924 so it had to fit the bill when and if it ever became available. To my shock, after more than five years of searching I came across a raw example when my saved eBay searches turned up this copy. I had to take a couple looks to make sure. I placed a huge snipe and won the card in June, 2010. It was a card I seriously thought I would never own. I had the card graded by PSA and it received a VG-EX 4 rating - top notch. 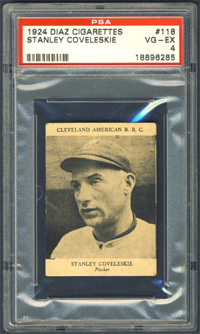 To date, it is still the only Coveleski graded by any company. 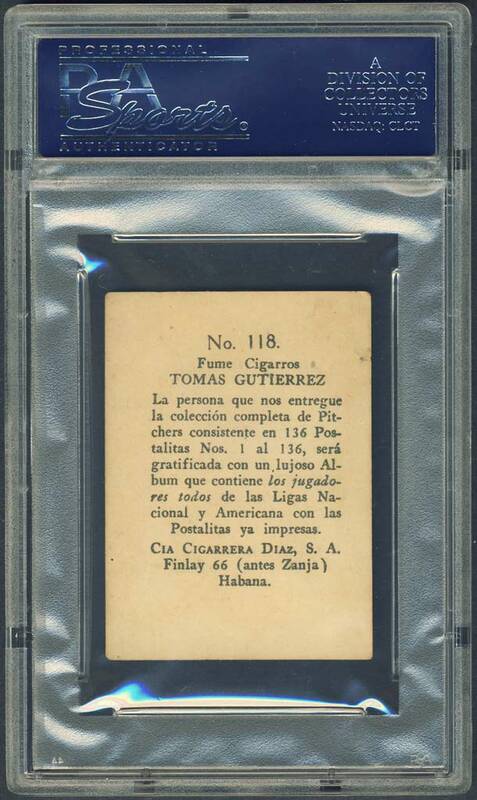 Description: Tomas Gutierrez, a Cuban tobacco company that specialized in Cuban League baseball cards, expanded northward to offer this early 1920s set of Major League stars. Because they were printed in Cuba and feature only pitchers, the 1924 Diaz Cigarette cards are among the rarest and most intriguing of all tobacco issues. Produced in Havana for the Diaz brand, the black-and-white cards measure 1-3/4" X 2-1/2" and were printed on a semi-gloss stock. The player's name and position are listed at the bottom of the card, while his team and league appear at the top. According to the card backs, printed in Spanish, the set consists of 136 cards - all major league pitchers. But to date many examples have yet to be discovered, and several never played in the major leagues.